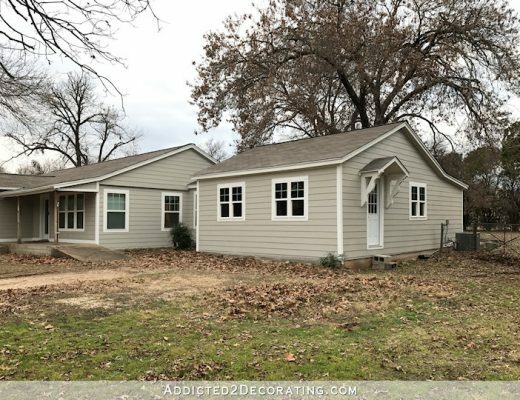 When it comes to doing temporary makeovers, like the one I plan to do on the front exterior of my house, one of the biggest challenges for me is deciding which items are actually temporary and need to be done as cheaply as possible, and which items are actually going to stay put for the long run. 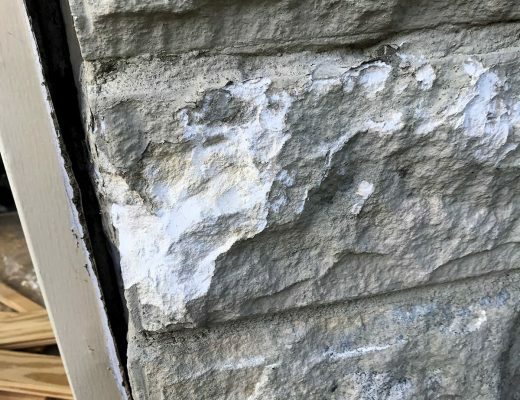 I’m fairly certain that the stone on my house will eventually be replaced with something else in the future, so in the meantime I need to update it as cheaply as possible (i.e., paint). And I’m 100% certain that the vinyl siding on my house will eventually be replaced with Hardi Siding, so that will also require a temporary and inexpensive update for now. What I’m less sure about is my sidewalk. To be quite honest, I’m not really fond of sidewalks that make a straight line from the street to the front door, and yet that’s what I have. But I’m thinking that I might just have to be satisfied with the shape of the sidewalk I have. Ripping that out and repouring a new sidewalk just seems like a lot of work and a huge expense for something that, in the end, will probably be pretty inconsequential. But what I can do is give the sidewalk a completely new look, and right now I’m leaning towards the idea of adding brick pavers to the top of my concrete sidewalk to give it some character. Out of all of the paving materials available, brick is my current favorite. There’s just something so beautiful and charming about a brick sidewalk. Traditional Porch by Nutley Landscape Architects & Landscape Designers Landscape Techniques Inc.
My favorite bricks are the ones that are reddish in color, but look old and faded like the ones above. While I’m not particularly fond of the really saturated brick red color, I do think that this next picture shows that even a straight brick path from street to door can be quite charming. That awesome white picket fence and open gate help, too. I could actually add some curve to my sidewalk by adding a path that veers off from the main sidewalk and goes to the driveway, like this one has. That would help to visually break up that straight line, although I really do think that just adding brick would be enough to turn my straight path of solid concrete into something really beautiful. So to that end, I’ve been looking into options, and I found that Home Depot actually carries thin brick flats, which are slices of actual brick that are just over 1/2-inch thick. They’re not cheap (about $8.30/square foot, which would add up very quickly), so this is definitely something that I need to really think about and plan before jumping right in with both feet. And so far, Home Depot is the only place I’ve looked. I’m certain that local building supply companies carry these as well, because I’ve seen Chip & Joanna use these on a sidewalk on one of their Fixer Upper homes, and they bought them from a locally-owned store. So I’ll definitely need to shop around, but I have a feeling that they’re going to be quite expensive. So I really need to have a solid plan in place before I move forward with this idea. For example, if I really do want a walkway between the main sidewalk and the driveway, then I’ll probably need to have that poured first. And do I want a walkway going the other way towards the big side yard on the left side of the house? I’m thinking I do. And I also need to decide how I want this incorporated into a driveway in the future. I know I don’t want a brick driveway. As much as I love brick, I think an entire brick driveway would be overkill, but I might like a brick-lined concrete driveway. Maybe. I’m just not sure. And then I have to consider the fact that we’ll eventually be extending our front porch out several feet (hopefully, if the city approves those plans). So if I brick the sidewalk now, and the several feet of the sidewalk towards the front porch gets covered up in the future, is it worth it to do it now? I guess that depends on how far in the future our front exterior remodel will be. If we’re looking at several years, then I think it would be worth it to go ahead and do it now. And this is why I really hate temporary makeovers. 🙂 I find it so frustrating to figure out all of the logistics, and decide what portion of the permanent, long-term stuff can and should be done now, and what I should wait on. But the good news is that I don’t have to decide now. As soon as the weather clears up, I can move forward with my painting and front porch plans. That should keep me busy for a while. And then I’ll just see how everything else evolves. But in the meantime, I’m going to keep looking at and dreaming about beautiful brick sidewalks, and envisioning my own sidewalk looking so charming. Next Post What Color Is Best For Garage Doors? Looks pretty! If you are looking at cutting costs, you can try a mix of cement and bricks, I am on a tablet and having a hard time copy and parting, but if you put “cement and brick sidewalk” in browser and choose images, you will see lots of curved sidewalks that are stunning with minimal bricks. Perhaps, concrete staining. I think you can incorporate patterns to make it more wow. Agree. If you put bricks on top of concrete, how are you going to get them to stay put? I have seen stained concrete, it looks nice. I am not sure how it’s done but I have seen the end product and it looks very good. You adhere them with modified thinset mortar, just like tiling. You should look into concrete staining and stamping! I think that would be cheaper (I could be wrong) and then you can incorporate a new shape as well. I was going to suggest the same thing. It would be a less expensive alternate idea. I’ve seen some really stunning concrete stains that look great. At our last house, we covered an old cement patio with bricks/pavers. It looked so much prettier. We used blocks that were half the normal thickness. We put in a thick layer of new topsoil on the grass which made up for the new height and laid down new sod over that. By the way, people put old bricks on Craigslist if other readers are looking for an inexpensive source. I was actually looking at that option this morning. I’ve looked at many painted faux brick sidewalks and porches, and none of them look real to me, but I think people just don’t use enough color variation. Most just use one solid color, so it looks obviously painted on. I might try my hand at it, and see if I can get a more realistic look by layering on various colors. It would definitely be cheaper! Try this, Kristi! You are so talented, you could definitely pull it off! I painted ‘bricks’ on my concrete porch floor and loved the results! Cheap, fast, and effective!! Patti did you have any problems with the painted bricks wearing off? For now, I think you should plan to pressure wash and then stamp/stain the walkway. 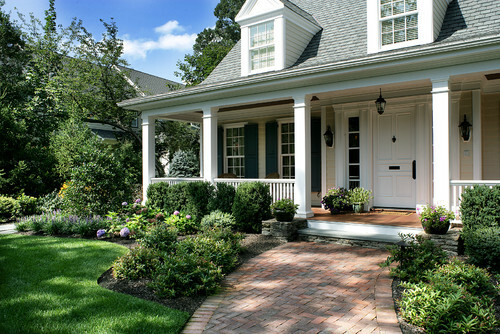 I would wait on laying any kind of brick until you get an overall landscape design in place. Once you rip out that pecan, you may want to have your walkway meander over in that direction, so that the walkway ends on the right side of the mailbox, instead of the left side, as it currently does (when looking from the street to the house). If you really want some brick now, maybe you could just clean up the concrete and then line the concrete with brick on either side. Those bricks could be pulled up, if you decide to move the walkway in the future. There’s really so much you can do with your yard! I suggest flanking the sidewalk with brick. The sidewalk is not currently proportioned to your size of yard. By adding width to the walk way, it would give you a focal point that is visually pleasing without breaking the bank. Curvy lines can be achieved in landscaping. You could always have them dye and stamp sidewalks and driveway to appear to be brick (like the pinterest page shows https://www.pinterest.com/buildingworksau/stamped-concrete/). Some poylmetric sand in the groves would make it look more authentic. Just thoughts for the future. It’s good that for now you are daydreaming and trying to come up with ideas, but at this time I would not do anything permanent in regards to your walkway. My thoughts are to have your house exterior remodel complete, no matter how long that may be in the future, porch extended etc. before going the route of landscaping hardscapes. You will need the pecan tree removed before moving forward with it. If it were just to stain the existing sidewalk that would be a temporary fix, but to go to the expense and possibly having to re-configure a permanent, already done and in place walkway could cause heartache as well as headache. Also, as you may already be aware of, when deciding on your brick, know that there’s a difference between brick used on houses as opposed to brick used for landscaping purposes. I’m on your side, Kristi, and just relaying my opinion based on my own experiences. I agree. I wouldn’t touch your walkway until the exterior changes are complete. It’s a waste of time. I would also wait on landscaping hardscape until you are done with both the front and back exterior changes. Plants can be moved, but hardscape is much harder. I would hate to see anything permanent destroyed during construction. Trucks are brutal on landscapes. Does anybody use your front sidewalk? Our house has a similar layout to yours and we walk up our driveway and then over to the front door on a sidewalk that connects the two. I also hate the sidewalks that lead straight up to the front door. I’d tear it out and plan to use the driveway to access the front door. UPS, FedEx, and the mailman use the sidewalk several times a week. I do find it very convenient to have a sidewalk from the door to the street. I agree. I’d definitely leave the sidewalk. Don’t you use it every time you go to the mailbox? I hate walking through grass. (but, I have a million allergies.) I kind of like your straight sidewalk. With some embellishments, it will be great! Plus, you can plant flowers down each side and that would look gorgeous! You don’t seem to have sidewalks in your neighborhood, so do you really need a walkway that leads to the street? You could have a pathway that curves/meanders from the front door to the driveway, especially if most of your visitors park in the driveway or can use the driveway to get to the path leading to the door. my thought exactly. there would be the cost to remove/alter the existing sidewalk, but that would give you the opportunity for those beautiful winding brick pathways! keep up the good work – you’re inspiring this Ohio gal to get to work outside! We get deliveries several times per week from UPS, FedEx and the mailman, so I do find it convenient to have a walkway to the street. I think what they’re saying is get rid of the main walkway to the street and do a meandering one to the driveway. Delivery people can then pull up near the driveway, walk up the drive and onto the new path to the front door. Of course this would mean moving your mailbox next to the driveway because you would have no path to get to it, lol. But I agree with earlier posters- wait until you formalize your landscaping plans. Or, do the least amount to make it look good in the short term. Staining and stamping concrete has come a long way and some of them look fantastic. I would hate to faux paint bricks up that long walkway as I think it would take about a year to do while dodging the weather. If you really prefer a meandering walkway – I do, too, it’s so much more pleasant – then I would definitely not start with the walkway before changing all the other elements in the front lawn. I think the ideas above re. stamping the concrete or lining it with a simple brick border are great for the time being. They allow you to change your existing (and slightly boring) sidewalk without going too far in spending money and your time and effort and you can then coordinate the changes when you rebuild your porch (what a great idea again!! ), e.g. you can decide whether to continue the bricks up the stairs (if you’ll still have stairs?). Japanese maples are very pretty. Tiny red trees that kind of hang over. Very “in.” Kristi I bet you would like a Japanese Maple. Or a dogwood or some other smaller flowering ornamental tree. In general having a straight path and a walkway that is the easiest route makes sense as that is where most people will end up walking and straight in this case makes a lot of sense. Just look at public areas where there are curved walkways and people have been cutting across plantings or grass to get where they need to go. I think your straight walk makes sense logically so I wouldn’t change it. A path to the driveway would be a nice add though. Have you considered making the concrete lined with the bricks instead of an actual brick path. Seems it would be more wheelchair friendly and still look very nice. I totally agree with you. When the pretentious Anderson Graduate School of Management went in at UCLA, where I had the misfortune of working at the time, the incompetent architects had the landscaping around it done with all these curved paths. These made getting from Point A to Point B much more effort and time. I just cut across the ground cover (they didn’t have actual grass). I noticed that I was not the only one. For people who just use curving paths, the curving aspect is a HUGE nuisance. I have read about people actually buying regular brick and cutting them on a tile saw or other saw to make the veneers. I would definitely add to that walkway to the sides etc. I agree about a curved walkway. We have always had sidewalks that come from the driveway to the front door. I think I would just eliminate the one from the street altogether. We’re currently working on creating our sidewalk from the driveway to the front steps. We’re putting brick pavers as edgers, then planning to fill in with river rock. I just felt that the rock fit in better with our woodsy location. Then you’ll just have the mail man and the FedX guys, etc., walking across the front yard to make deliveries. I don’t think so. At least it doesn’t happen at our house. They park in front of the driveway, walk up the drive and onto the sidewalk leading from the drive to the front door. When they’re carrying boxes they don’t want to walk on uneven grass, plantings or dirt. I am a mail carrier, and when making deliveries, I typically take the shortest route, even if it involves walking on uneven, grassy areas. Time constraints and weight of parcels have made me reconsider my mother’s teaching of staying off other folks’ grass!! (Though I still feel guilty and hope the homeowner doesn’t see me!) Please keep the sidewalk to the road. I love brick walkways too. Our house originally had an asphalt front walkway with a weird curve in it. We ripped it out several years ago and re-laid a brick paver one. We had to dig out a lot of old tree roots, etc and lay down a lot of crushed stone as a base for the full-thickness paver bricks. We straightened it because our driveway is on the side of the corner lot with the garage under the house and a curved walkway looked weird because it didn’t connect to the driveway which is bordered by a 4-ft retaining wall (we also replaced the old cracked cement one with a stacked stone one). It took awhile to put in, but the brick walkway looks soooo much better. We did a basketweave pattern with a straight line border on each side. Straight sidewalks are boring and bad feng shui! 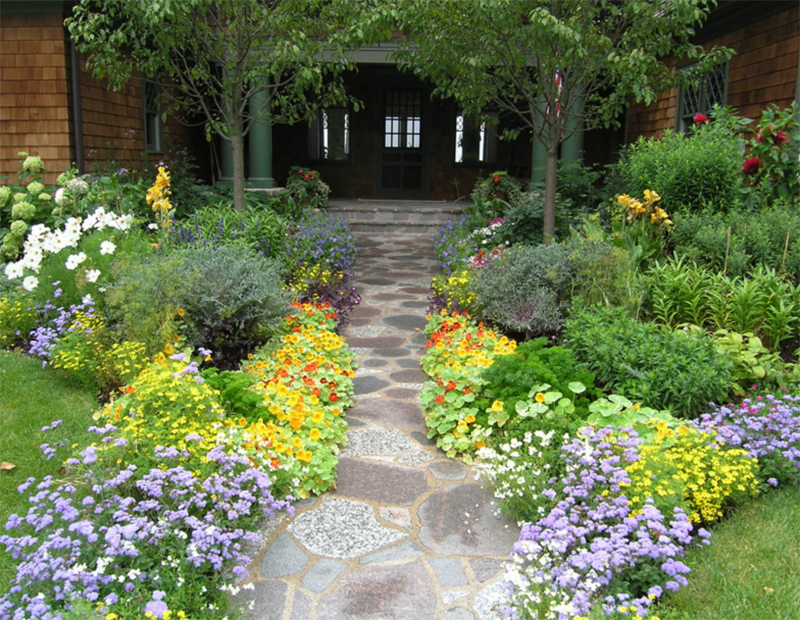 In the meantime, until you are rock solid in your plans, you could create the illusion of a winding, or curving pathway by “zig-zagging” the plantings on either side. Create curved beds that cross over to the other side of the path to make it seem as if it curves, making a serpentine feel to it. I may not be explaining it very well, but I have done this with pretty good success in the past when financially it just isn’t feasible to pull out a new straight side walk and start over. One caveat on brick sidewalks. If this is your forever home, remember that bricks tend to shift with the ground over time. I love the look, but ours has sunk in spots, creating nasty puddles of silted soil when it rains heavily. The sidewalks down the street have all sunk at the same spot so I assume it’s some sort of shift along the whole block. Concrete won’t do that quite as readily. I do love a meandering path but after you power wash the sidewalk and paint the house, doing some landscaping across the front and down the walkway would go a long way to taking the focus off the linear, concrete sidewalk. There should be a lot of choice in your area for 3 and 4 season plants and flowers with a lot of texture and/or color. When you eventually hire a landscape designer, plants can always be moved to a different location so anything you buy and love would be an investment. I love the brick pavers, but i would wait until you do the permanent redo on the outside of the house. 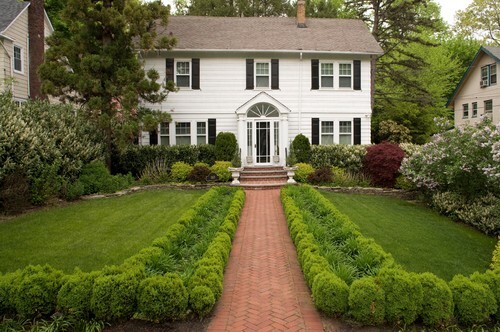 For something additional to spruce up along the walk, plant some boxwood hedges or whtever your preferred plantings. This will soften the sidewalk. Another option is to stain the concrete a brick color. You also can skim the concrete and then stamp the new skim coat of concrete to look like brick. Also maybe make the large side yard a destination. Put and arbor and some seating, some plants and even pots of florals for color make it a sanctuary for you to sit and relax. Just a warning about those bricks from Home Depot, they are not meant for floors. I, too, wanted to use them, but in my laundry room instead of outside. I was told these are only meant for interior wall projects, like to make a fake exposed brick wall. If you go with this option, you will probably want to shop around for an exterior floor-grade option. I think these may be different from the ones you looked at. The description says they’re for interior and exterior use, and in the question/answer section, someone from the brick company gave instructions for using them on floors. I had a neighbor who sponge painted her side walk to look like brick and it really turned out nice. She cut brick shapes out of sponges, tore the edges a bit and sponged on red bricks. Then, she went over them with hits of black and white here and there and got a look that you could not tell was not real brick until you walked right up to it. I think if you pressure washed the side walk and then just painted brick down both edges it would also look good. If it were my home I would leave the walkway as-is for now. Instead focus on a complete design that will make you overjoyed every time you come home. Then roll out your design over a few years. I hope you will consider putting in a white picket fence/gate at the front. 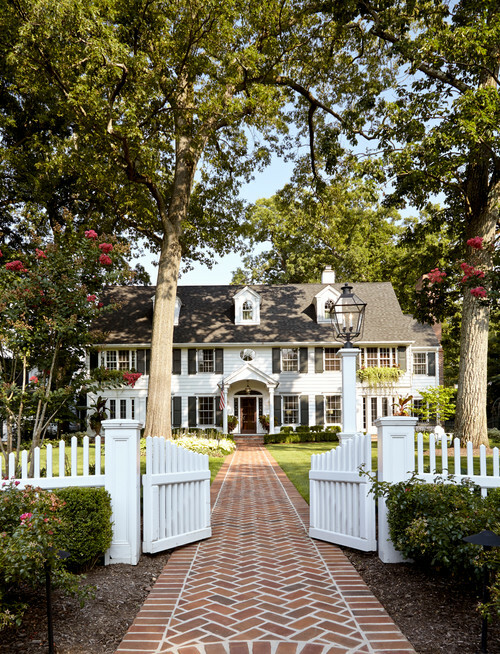 In those photos you used, the most charming walkways included a white picket fence. 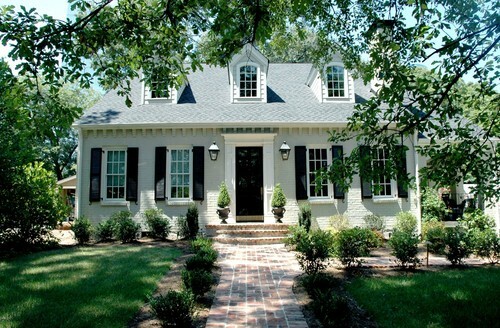 Since you are planning to paint your trim white, there should be no color conflict. My friend owns faux panels.com. It’s an excellent product and an amazing company. 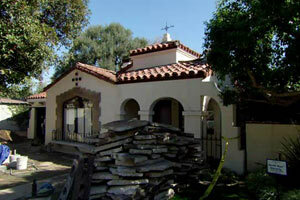 They have been featured many times on extreme home makeover. Check them out, I think you might like what they have for the exterior of your home. How about something like Southern Hospitality did on the Troybilt Challenge last year? She used a stencil and her pressure washer to make it appear that her driveway was cobblestone. Maybe a brick pattern stencil exists. – Paint it. There are a bunch of great concrete paint products out there right now and it would even out the color, since you seem to have two different color concretes (maybe there was a patch?). Even if you just choose a gray, at least it’ll be a uniform gray. Later, if you need to veneer it, you can find a bonding agent that’ll stick to the paint. You could also choose a brick red with a texture. – Another option that’s odd, but I’ve seen done, is outdoor carpet (glued-down). Beware that it’d probably have to be power washed at least once a year. You can also tile concrete, but it might be hard to find something that is non-slip and looks “outdoorsy” enough. Maybe tile the edge like a kitchen backspash border? – Make thin curvy planting beds on either side of it and mound them up in spots to detract from the straight lines. It might make the sidewalk look curvier without actually being curvy. The height will also give the lawn more texture. 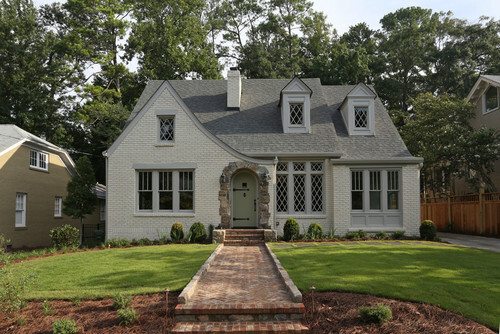 – See if you can find a place that sells or gives away second-hand bricks that have been demo’d from a building and “soldier” them (stand them upright domino-style) on either side of the walkway like an edging to give it more definition and character. 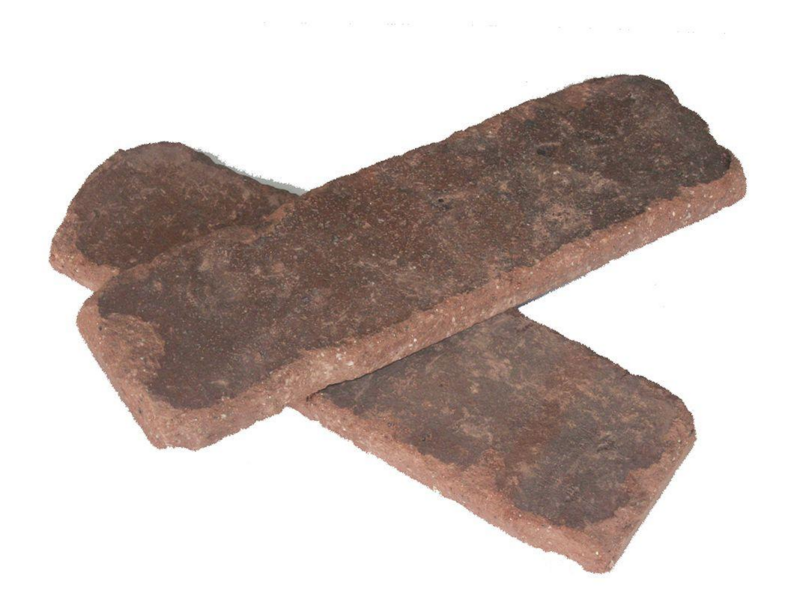 If you can find a brick splitter, you may be able to cut them in half and even save yourself money. – Add brick veneer stripes. This might not make sense with Matt, since it’d create a raised surface, but you could add brick veneer cross-stripes as if it was a concrete walk that begins and ends in brick patches or is framed in brick. Or, you could veneer the very end of the walk and the beginning or just the steps. Basically, something to break it up and make it look like less of a sea of concrete. Also, I saw something on TOH once where they broke-up a walkway like yours and then used the chunks of concrete like pavers to create a new walkway (embedding them into the dirt). It ended-up looking like one of those flush walkways with grass between flagstone pieces (and you mow right over the walkway to catch the grass spacers), except the flagstone was leftover concrete pieces. It might be cheaper to have it broken-up and left for you to reposition (with more fill) than to have it broken-up and removed. Just something to think about. I’m not sure it’s really your style given your inspiration photos, but it was worth mentioning. I’d look at the staining concrete option for a long term fix until a total concrete redo. Snoop the stain company sites, and concrete folks’ sites for skills and ideas. A neighbor years ago removed the destroyed astro turf on their porch and stained over the glue stains for a stunning new look. With enough colors, the effect is amazing. North Park Mall in Dallas has the polished plain concrete floors. Stained could work for you now , stamped stain when you redo. For the sidewalk from the door to street. This is how guests reach our door, deliveries arrive, we get to our mailbox, and so on. This was also how the movers delivered our stuff. Brick edging is a nice temp fix to widen the walkway. If you must add curves, lay out your garden hose along the existing walk to create curves with more concrete. You could still have the straight shot, but the curves would be there visually. And of course wide walks for deliveries and Matt. Pro movers get really happy with wide walkways with straight runs and no steps. Brick- I would worry about the durability, news covered the cost of fixing a short stretch of Camp Bowie BLVD in Fort Worth recently- constant repair. Also, think about traction for Matt in rain and ice and for those delivery folks and you. 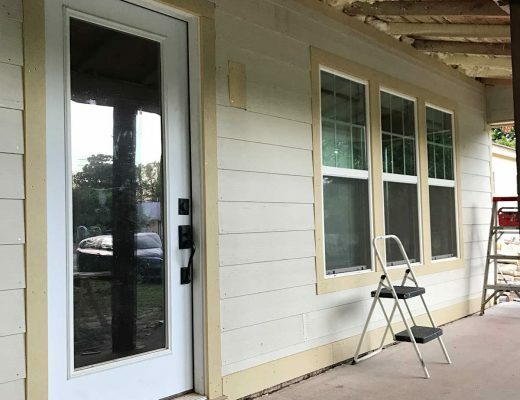 I think because of the expense, this is something you should wait on until the big remodel is done–when the front porch is done, and you meet and plan with a landscape architect. I think you want the final plan in place before starting this. However, I understand wanting a placeholder. What about using a large stencil with a brick pattern and doing something like you did with your fireplace? I’m sure it would be a horrible pain to do, but might give you the look you are going for on a much more reasonable “temporary fix” budget. Have no idea if this is even feasible…just an idea. On the whole, I LOVE the look of a brick walkway! Love the look of a brick pathway, but in our experience brick walkways are tough to navigate for people unsteady on their feet or in a wheelchair. If Matt or others are going to use the walkway…maybe outline the concrete w/ bricks? I completely agree. I know that Matt is always a main consideration when planning anything. Bricks give a bit of a bumpy ride for wheelchairs. I’m sure you’ve already thought about that so I’ll just wait to see what you come up with. To me, this is part of a garden design, and I would definitely wait until a landscaper designs my plants etc, not do it with the painting. Matt doesn’t use the sidewalk. There are steps up to the porch on one end, and a step down to the street on the other end, and no connection to the driveway at this point. He uses the ramp on the porch to the driveway, and if he needs to get to the street, he uses the driveway since it slopes to the street. I love the idea of staining the concrete. Even if you don’t stamp a pattern onto it, you can create shading with two different colors of stain. I can’t recall the method but I was at a Lodge that stained the concrete floor in their rustic main dining area. It was gorgeous! If you’ve seen those tables made from burl wood it looked very similar in design, but on a concrete floor. If you weren’t told it was concrete you would never know. It looked like some sort of exotic wood floor. I think I recall that the effect called for splashing some sort of liquid over the freshly applied second coat of stain to achieve that effect. Of course, since it was indoors, they also applied several layers of clear coat on top but you wouldn’t have to do that on the sidewalk. To achieve a more interesting shape before you’re ready to replace it completely, you could add curved landscape beds on either side and create whatever shape you wanted. Add small shrubbery, perennials and natural wood mulch and it would be gorgeous. Since you have so much shade from the big oak tree, hostas love the shade and grow quickly to fill out beautifully. And there are so many colors and sizes to choose from. Plants are easily relocated when you decide to change the sidewalk. If you’re going to lay brick down anyway, just do it in the curvy way you actually want. You’ll love it every time you see it, and it will be money well spent. I agree with others about not doing much until you have completed your porch project and landscaping. If it bothers you, I would do as others said and line the existing walk with a row or two of brick and leave it at that. Once you power wash and clean the walk, it will be better. I would consider adding some curved aspects to the landscaping, maybe in large sizes. 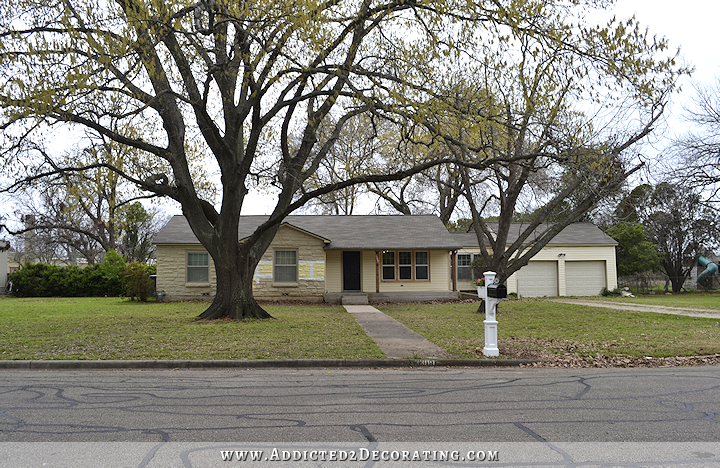 Once the Pecan is gone, you have a lot of blank yard there! Adding curved large beds will diminish the runway look of the walkway, and you can incorporate a walk addition towards the drive as well. 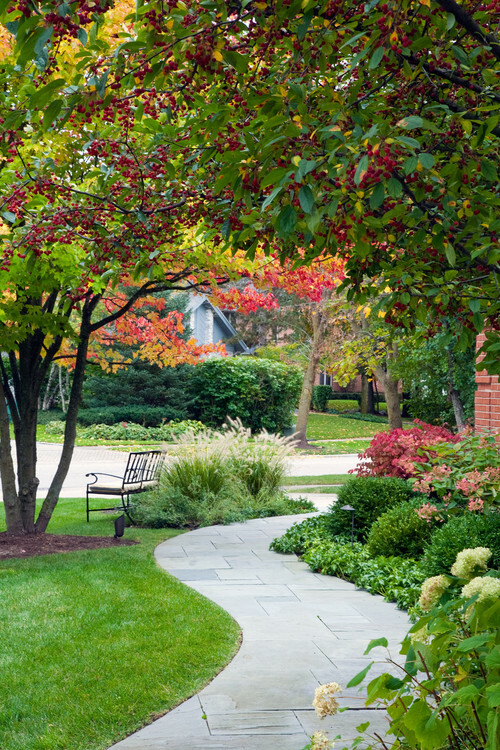 A landscape designer can help with the walk ideas as well as the planting ideas. I’d rather see you spend the money on them instead of the glue on brick! I didn’t have time to read through all the comments, so don’t know all that has been suggested, but you might think about softening the straight side walk with curved flower beds with the brick as edging, in loops staggered to each side up to the porch. The illusion of curves and not a huge change. Just thinking about ‘now’ flower beds, that could be made larger later.I could draw it for you, but hard to describe exactly what I mean! Can you put a row of bricks along the edge of the straight path or else break up the path with a small circular section. Kristi, after having just completed major re-landscaping for our home I would really advise against anything with much expense or permanence. In earlier posts you talked about having a landscape plan done. I would really advise going that route but I told you about all that in another post and how much having that plan has helped already. One of the ways a plan helps is in choosing the best materials for your job to get your desired results. Our designer knew of several things we were not aware even existed. He gave us the pro’s and cons of each, as well as pricing. Surprisingly some of the better options weren’t the most expensive either. I’d hate for you to put in something permanent only to find out it doesn’t work best for the plan you eventually have done. I like two things that have been talked about in the comments; First is the painting idea. You can get stencils for lots of brick and stone patterns and I agree with you that it really isn’t a one color paint process. The ones I have seen that I really, really liked, whether simulating brick or stone, have all used multiple colors. 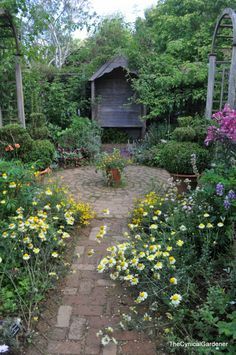 As one comment said, you can do a lot to eliminate the “straight line” look of the walk with the design of the beds, flowers, trees and other focal points. I’ve seen it down with some really “WOW” outcomes. Until you have a clear overall plan in your mind, I’d keep it simple and inexpensive so you don’t end up spending more bucks undoing what you do now. Besides, throw a few flower beds close by in different places and it won’t look nearly as stark to you as it does know, completely unadorned. My mother has a sidewalk that was created to look like brick. Some kind of brick-colored hue was mixed with concrete, which was then poured, and a brick pattern with an aged surface was pressed into it. Before it dried, it was sprinkled with a grey powder that mottled the surface and made it look old. Looks remarkably like the real thing. I think if your front sidewalk is going to be short you should go with brick, but if you plan to do a more extensive series of sidewalks on your property, you may want to consider the alternative. It might be easier for Matt’s chair to travel on. One of the college towns I lived in had brick sidewalks everywhere which were gorgeous, and easily tripped on. What about a brick lined sidewalk. Then over to the driveway, use a mixture of concrete pavers and brick. Add some interest to the steps on the porch with brick. I used those thin slices of brick once years ago on a wall in a little farmhouse we were remodeling..and then I kind of covered the brick..or white washed so that only a bit of the brick color peaked out…here and there….alot like the German Smear they did recently on an episode of Fixer Upper…my brick wall looked wonderful…i was glad i tried….as for temporary fixes…i totally agree…I dont like them either… I have been living with some absolutely ugly carpet for over a year now….I have my flooring… sitting in my utility room..the ceramic tile that looks like salvaged..or distressed wood…Im waiting for just the right time to put it in….and also trying to decide about tiling the foyer in a black and white marble..also like that the episode on Fixer Upper…and I agree…it depends on how long u have to wait…this year plus has been so annoying but I want to have it all paid for..and the labor is quite high….wish i had YOUR skills young lady!!!! You could faux-paint bricks now then after you’ve done your front porch extension, do the real thing. That way you get a cheaper, temp fix now (and can see if you would like the real deal) and wouldn’t waste time/energy/money having to rip up real brick later.